The Norse chair designed by Simon Pengelly for Modus has been awarded the prestigious Design Guild Mark. Now in its seventh year, the Guild Mark rewards excellence in the design of furniture in volume production. The criteria are for excellence in four fields -design,the use of materials, manufacture and function. The Norse chair, designed by Modus long term Modus collaborator Simon Pengelly, is a contemporary take on a Scandinavian style chair, with a light feel and a distinctive contour. 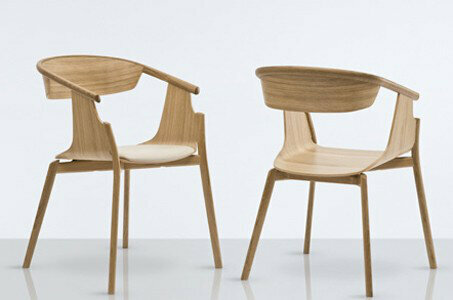 Born from the designers desire to explore traditional chair making techniques, flavoured with a modern aesthetic, the chair is produced from solid steam bent ash or oak. The elliptical legs and arms connect with a pressed ply backrest and seat with optional upholstery pad. As well as ash or oak the chair can be specified in a range of paint colours.